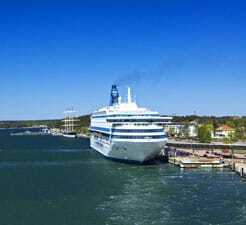 At directferries.co.uk you can plan, compare and book your ferry to Aland sailing to the port of Mariehamn quickly, easily and securely online. Our comparison tool allows you to view Mariehamn timetables and ferry prices on all possible routes removing the need to check numerous other websites. "A most enjoyable trip for a first timer"
I enjoy spending my time on the ship. There are many facilities that I can spend my time in. I just hope that the there is an english version of showtime for foreigners like me.